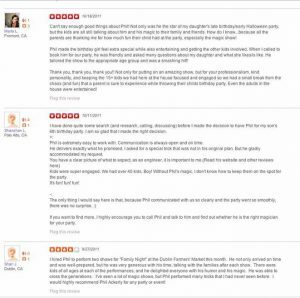 OK, it’s time for me to vent my frustration about Yelp. 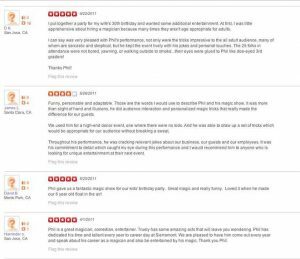 After doing a show, I have had many clients tell me that they would write a Yelp review on my Yelp Page. Well, I could never find their review. I was quite surprised to find out that I have 19 reviews on my Yelp Page that are NOT visible! That is. they are hidden from readers view. The only way to read these hidden reviews is to click on the link 19 filtered in a very light-gray text at the bottom of the visible reviews, above the line: About This Business. 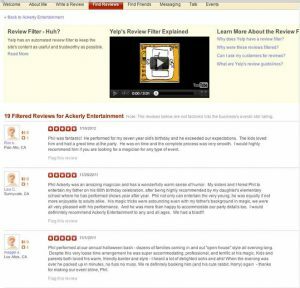 Here is what Yelp says about filtering reviews. We try to showcase the most helpful and reliable reviews among the millions that are submitted to the site. Not all reviews make the cut, and those that don’t are posted to a separate “Filtered Review” page. Filtered reviews don’t factor into a business’s overall star rating, but users can still read them by clicking on the link at the bottom of the business’s profile page.We use filtering software to determine which reviews should be filtered on any given day among the millions that are submitted to the site. The software looks at a wide range of data associated with every review. We intentionally make the filter difficult to reverse engineer – otherwise, we would be overrun by reviews written by people hoping to game the system. So while it may be tough to decipher how the filter works, the rules are actually the same for every business and every review. 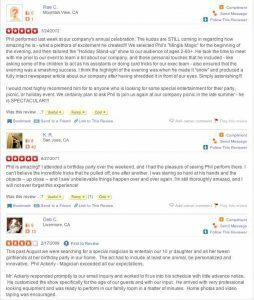 I guess if you are a dedicated “Yelper”, then you are more trusted and your reviews are not as easily filtered. What’s your take on Yelp? Do you read reviews about a business you plan to use? Have you written reviews or been reviewed? l would love to hear about your experiences. Call me or shoot me an email.